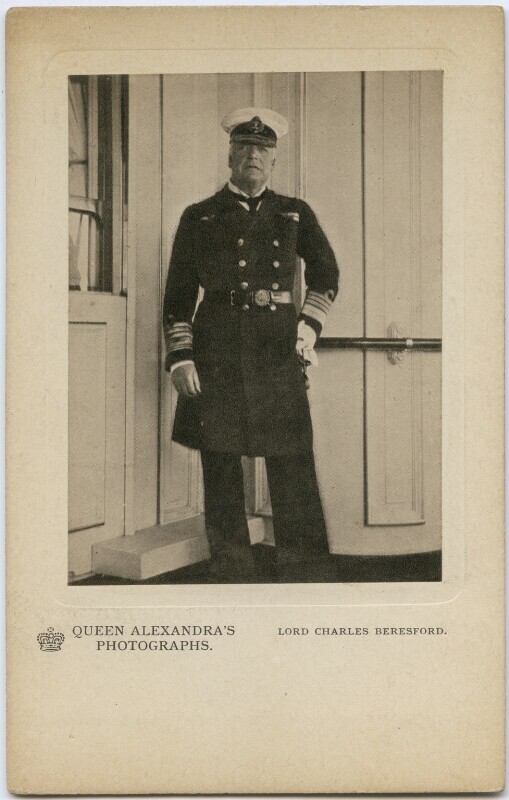 Charles William de la Poer Beresford, Baron Beresford (1846-1919), Admiral and Conservative politician; MP for County Waterford, Marylebone East and Portsmouth. Sitter in 55 portraits. Emmeline Pankhurst forms the militant organisation, the Women's Social and Political Union, campaigning for greater rights for women and to secure them the vote. Its members were known as 'suffragettes', and adopted the slogan of 'Deeds, not words'. Joseph Chamberlain resigns as Colonial Secretary to campaign for tariff reform and an end to free trade, a key economic issue which splits the Conservative party. Henry James publishes The Ambassadors. Autobiographical in tone, it movingly and humorously traces the conversion of the American Lewis Lambert Strether, sent to Paris to find his widowed fiancee Mrs Newsome's wayward son Chad, to European culture. Charles Rennie Mackintosh, the leading Scottish arts and crafts designer and architect, designs the Willow tea rooms in Glasgow for his patron, Miss Catherine Cranston. The Bolsheviks (meaning 'the majority'), a faction of the exiled Marxist Russian Social Democratic Labour Party, are formed after splitting from the Mensheviks at the Second Party Congress in London. After gaining independence following the end of the Spanish-American war, Cuba is forced to accept a permanent US military presence at Guantánamo Bay.